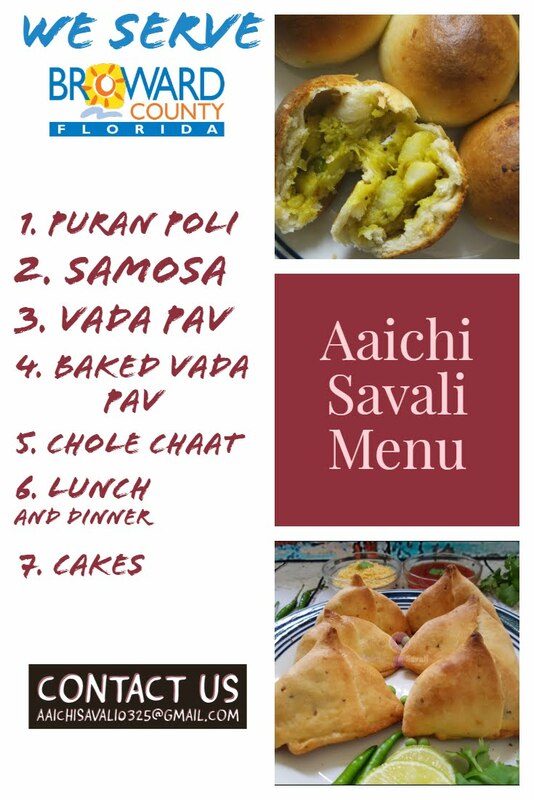 How to prepare Authentic Maharashtrian style Aluchi Wadi. 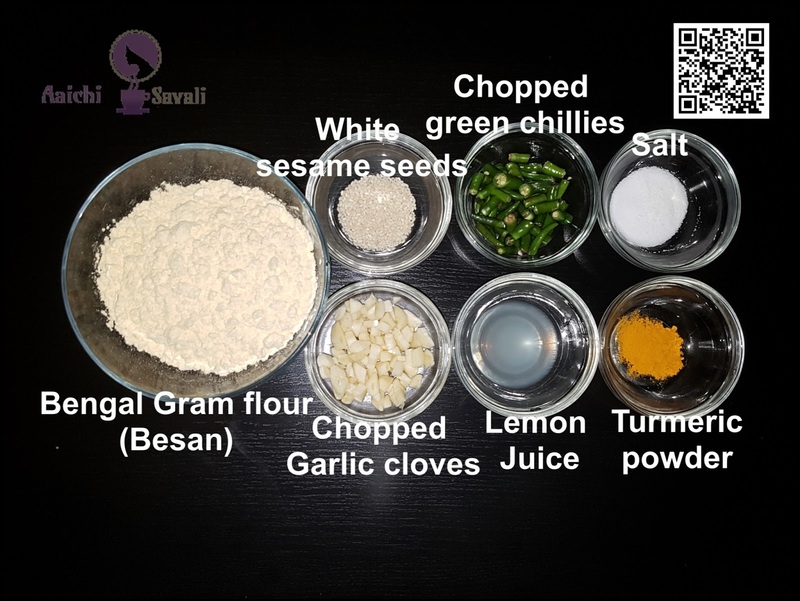 Maharashtrian snack recipe prepared during special occasions and festivals. 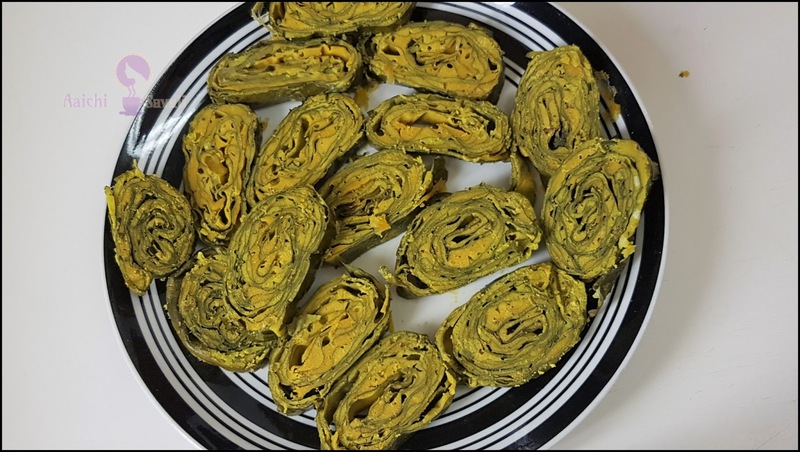 Delicious rolled leaves that are stuffed by using chickpea flour and spices, and then steamed and stir-fried! It is a rich source of dietary fiber, vitamin C, calcium, and B- complex vitamins. Alu wadi is alternatively known as a wadi, Patrode, Patra, colocasia rolls, etc. in different regions. Spicy, crispy and tangy taste and tempting looks. Know how to make Alu Wadi, Authentic Maharashtrian recipe here! 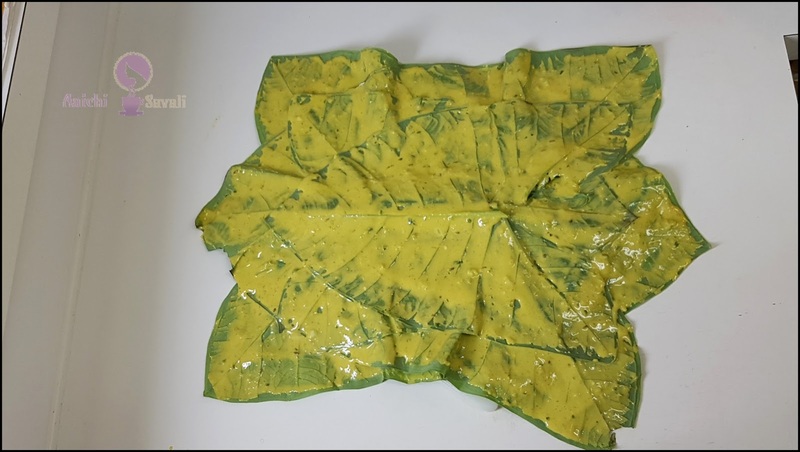 Wash Alu leaves / Patra leaves / Colocasia leaves and wipe them with the dry cloth. Keep aside. well to make thick batter. three o four leaves, roll the edges vertically and spread little batter on them. 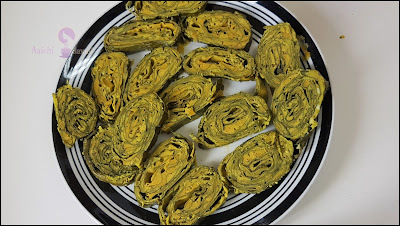 Now roll them tightly and while rolling keep on applying batter on each fold. Place the rolls on a steamer and steam cook for 20 minutes, remove from steamer and let it cool. Cut into thin slices. You can deep fry or can temper them. For tempering heat oil add mustard and cumin seeds once it crackle add sesame seeds, curry leaves and asafoetida and finally the sliced alu vadi rolls, saute till they turn to browned. Here, scrumptious, mouth watering and tasty Alu Wadi is ready to serve. Enjoy!!! 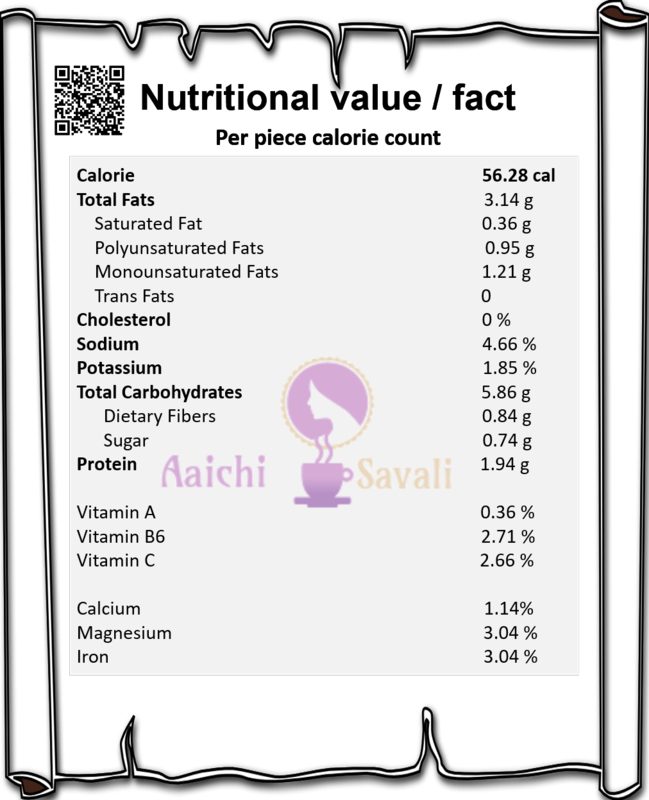 Per serving contains 56.28 calories, along with carbohydrates - 5.86 g, fats - 3.14 g, proteins - 1.94 g.
***Please Note: the calorie per piece can vary based on the piece size. Alu or Patra or colocasia leaves are very healthy as they are low in saturated fat, cholesterol and sodium. It is a good source of protein, dietary fiber and many important vitamins such as Vitamin A, Vitamin B6, Vitamin C, Thiamin, Niacin, Riboflavin and Folate. 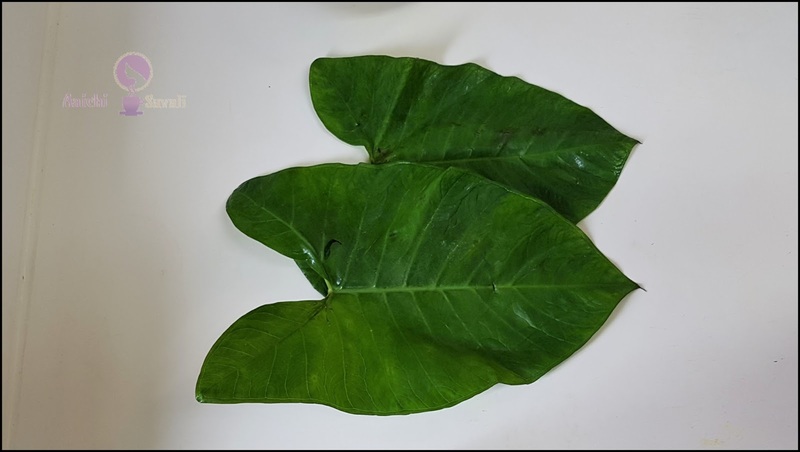 This leaves can provide with good amounts of minerals like Calcium, Copper, Iron, Magnesium, Manganese, Phosphorus, Potassium, Selenium, and Zinc. 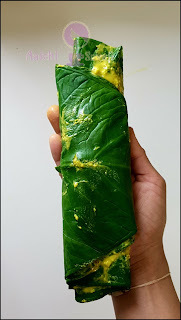 This leaves are rich in protein content and hence is an important source of energy. It contains high amounts of B group vitamins that play a key role in boosting your energy. 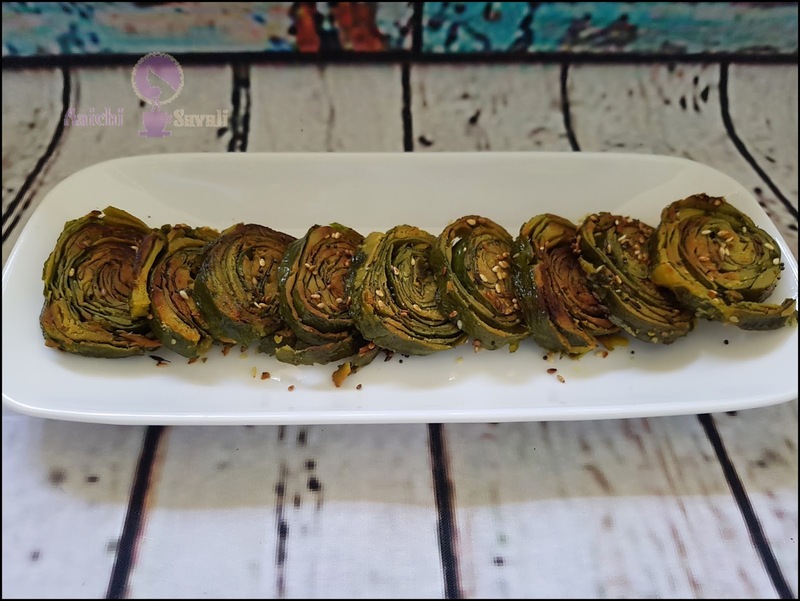 These are low in calories and saturated fat and hence can be considered as an ideal weight loss food. It provides good amounts of dietary fiber that satiates your hunger, making you feeling fuller for long hours. It's a good source of calcium that plays a key role in maintaining healthy and strong bones and teeth. It contain iron and helps to prevent anaemia, which helps in red blood cell formation. Also, its vitamin C content helps to absorb the iron well.